In Oil Well Testing Handbook, the author has presented a comprehensive study of the measuring and analysis of flow and transient pressure responses in oil wells. The basic principles are reviewed, and the applicability and limitations of the various testing techniques are critically discussed and illustrated with actual field examples. The material is presented in a form that will allow engineers directly involved in well behavior, pressure build-up, and flow testing to re-educate themselves in the subject. Click on given PDF download button at the end and get it for free. At the same time, with its up-to-data review of the literature and extensive bibliography, the book will serve as a useful guide and reference to engineers directly engaged in well pressure behavior work. The author has accomplished the intended objectives of the book in a thorough and excellent manner. Review the features given below and don’t to click on download. 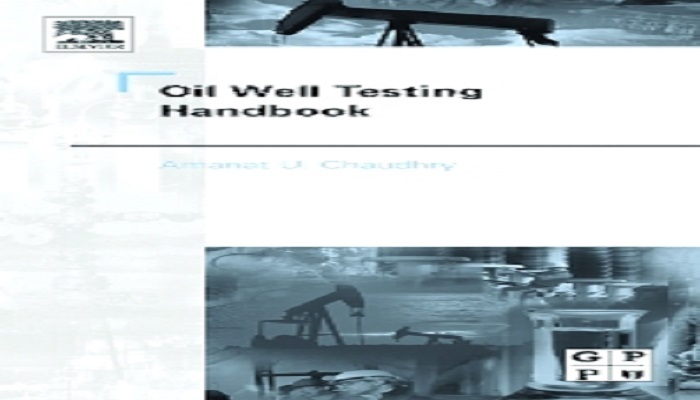 Oil Well Testing Handbook PDF Features. The major purpose of writing this book is to provide a practical reference source for knowledge regarding state-of-the-art oil well testing technology. The book contains new tables and graphs with each topics. Getting the pdf book allows you to read this book on your tablets and computers. You won’t face difficulty understanding it since the text used is quite easy. This book contains new tables and comparisons of the various methods of well test analysis. Chapter No2: Fundamentals of Reservoir Oil Flow Analysis. Chapter No3: Transient Well Testing Methods for Horizontal Oil Wells. Chapter No4: Pressure Draw down Testing Techniques for Oil Wells. Chapter No5: Pressure Buildup Analysis Techniques for Oil Wells. Chapter No6: Original and Average Reservoir Pressure Estimation Methods. Chapter No7: Well Testing Methods for Naturally Fractured Reservoirs. Chapter No8: Fundamentals of Type Curve Matching Methods for Oil Wells. Chapter No9: Flow Regime Identification and Analysis Using Special Methods. Chapter No10: Application of Pressure Derivative in Oil Well Test Analysis. Chapter No11: Massive Hydraulic-fractured Oil Well Behavior Analysis. Chapter No12: Drill-stem Testing Methods. Chapter No13: Interference and Pulse Test Analysis Methods. Chapter No14: Injection Well Transient Testing and Analysis. Chapter No15: Well Testing Methods in Multilayered Oil Reservoir Systems. Chapter No16: Pressure Analysis Methods in Heterogeneous Oil Reservoir Systems.